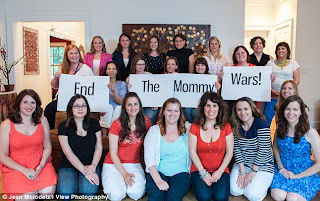 Mommy-wars. Or since we're in Ireland, let's say Mammy-wars. I can't stand the term, but it's the widely-used name for the phenomenon of mothers judging mothers on every element of parenting, originally coined to refer to mothers working outside the home versus stay-at-home mothers. Newspapers love the SAHM/ mothers working outside the home debate, as do radio shows, tabloid day-time TV shows and of course our friend the internet. Look at the comments on any feature about parenting choices, and you'll find provocative, extreme and very judgemental opinions, many hiding behind anonymous accounts. But to what extent does this judgement exist in real life? And how much of it is an assumption rather than a reality- to what extent are we assuming we're being judged rather than actually being judged? I think there are two distinct groups of mothers who are truly happy and secure in their choices: one group is made up of mothers who are choosing to stay at home with their kids, are naturally, instinctively great mothers, who enjoy every minute of being there with their children all day every day, who have no real financial worries – at least not enough to cause serious stress day-to-day, who do not need work for self-esteem reasons and are secure enough in their choice to not worry about being judged. On the other end of the spectrum is Marissa Meyer, the CEO of Yahoo who earned $36 million last year and just built a nursery beside her office for her baby boy. The rest of us fall somewhere in between. There are mothers who stay at home because they choose to, and can manage financially, though often by making big material sacrifices. There are mothers who give up fulfilling careers because they want to be with their children, but may have lingering thoughts of what might have been. There are mothers who stay at home because the cost of childcare is greater than any salary they can earn in their locality or area of expertise. There are some who mostly love being at home, though as do we all, sometimes have a bad day and would love to escape. There are others who are unhappy being at home and while they feel that they're doing the best of their children, they are less than happy themselves. Mothers are inherently sacrificers. There are mothers who work outside the home because they can't afford to continue paying the mortgage if they don't work. Many, many of these in Ireland today. There are mothers who go to work because they have a job that they love, and are trying to strike a balance between being a good parent and continuing to have a fulfilling career. Some who have no choice about working are lucky enough to also very much enjoy the job in question. For others it's much more difficult – being employed purely for financial reasons in an unsatisfying job is very draining and demotivating, and one of the most difficult situations for any mother - all the guilt, none of the satisfaction. There are no universal truths about the different circumstances mothers find themselves in and this is no place for sweeping generalisations. 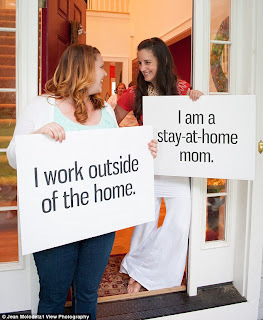 Nobody should assume that a stay-at-home mother is having an easy life and equally it should not be assumed that employed mothers are less interested in their children. But I'm just not sure that this is how the vast majority of mothers view one another - perhaps I'm naive, but I think most mothers are far too busy minding children and judging themselves to have time to judge their peers. Yes, of course there's a vocal minority, prominent on internet forums in particular. And yes this is an inflaming topic, which areas of the media enjoy fanning (I’m looking at you Daily Mail). But in real life, do you judge your friends who have taken a different path to yours? There will always be trolls – the kind of people who commented in the aftermath of the Prime Time childcare exposé that working parents making use of crèches were bringing it on themselves and were inherently self-serving. And many of us have someone in the family who is not so convinced by the choices we make – an aunt who thinks the working mother is letting her children down, or a mother-in-law who tells the stay-at-home mum that she’s wasting her education. But day-to-day in our lives, I don’t think there’s such a lot of judgement going on regarding mums going out to work or staying at home. Let’s face it – all of it can be very tough going at times, and most people know that. I know a small number of mothers who have three or more children and still go out to work fulltime and I know some mums who stay at home with their children fulltime. Most of the mums in my circle are somewhere in between though - working fewer or shorter days, trying to find some kind of balance that is optimal for family-life. Some days I envy the mums who are at home, especially during my most guilt-filled moments (or during the heatwave! ), but I'm under no illusion about the hard-work that's involved in being at home fulltime with children. I've done it while on maternity leave and for weeks here and there since I went back to work - it was tiring and at times very stressful (though ultimately rewarding and fulfilling in a way that far outweighed the exhaustion). I am certain that similarly, SAHMs sometimes envy their friends who go out of the home to work, and can have a cup of tea that isn’t cold, or sit in silence for a moment or two. So we know other mothers are not the enemy – there are enough battles to fight without arguing amongst ourselves; such as a tax system that disincentivizes parents from staying at home with children (as put very succinctly here by Aine O’Sullivan in a recent Irish Times piece), childcare that is expensive and now known to be improperly monitored (see more here), and inflexible employers who short-sightedly refuse requests for shorter hours and remote working. Previous generations of women fought for the right to work and we have that now – in spades. Today the pendulum has swung arguably too far in the opposite direction; many families would prefer for one parent to stay at home with their children but because of the economic necessity of two incomes to pay the mortgage, countless parents are now trapped into working whether they wish to or not. So let’s focus on creating a society where every woman has the right to stay at home, to work part-time, to take time out when her children are small – and fathers too. That’s a far better use of energy than fighting imaginary mammy-wars.